Many devices are now pulling double-duty these days. Game consoles are entertainment streaming devices. Smartwatches tell you the time while also telling you which of your coworkers is demanding your attention. Lightbulbs are burglar deterrents, at least when they’re not setting the mood. So Onelink’s Safe and Sound, a smoke and carbon monoxide alarm with an integrated speaker and voice assistant, isn’t exactly a far-fetched concept. It is, however, indicative of a future where connected devices aren’t just for nerds. You might not need a voice assistant, smartwatch, or a ceiling-mounted speaker, but everyone needs a smoke alarm. Whether you need a £192 smoke alarm is another. Onelink’s Safe and Sound is a smoke and carbon monoxide alarm with an integrated speaker, Alexa voice assistant (a version supporting Google Assistant is coming soon), and HomeKit compatibility. Currently it's only available from American retailers, but you can buy it from Amazon's US site for $250 (£192), although shipping fees may be steep. It’s definitely larger than your average smoke detector, and will stick out at least an extra two inches from your ceiling. That being said, you’ll quickly forget it’s there, noticing it only due to its convenient night light feature. It isn’t the only “smart” smoke alarm, either. There’s the notification-sending Roost smoke alarm battery, as well as the Nest Protect smoke and CO alarm. While both are capable of alerting users to fires via smartphone apps, the Nest lacks any voice assistant or music playback support, and had its most interesting gesture-based alarm silencing feature disabled thanks to the risk of silencing the alarm during an actual fire. 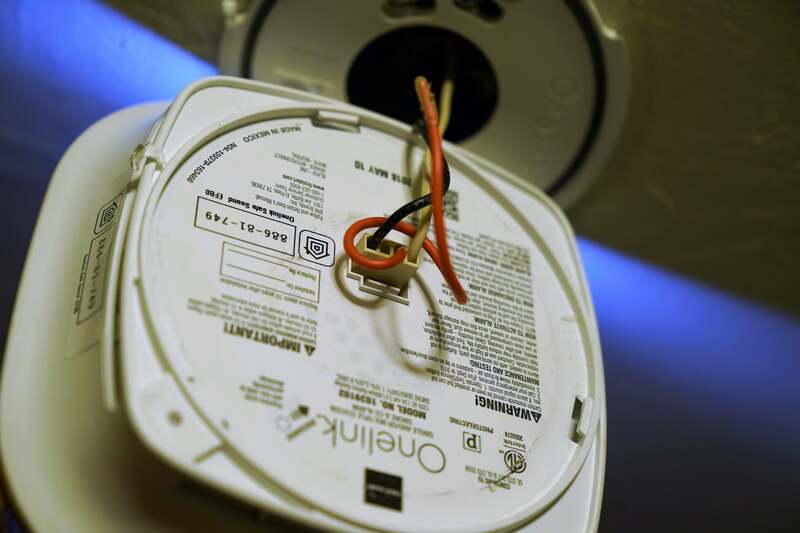 Installing the Onelink is a procedure nearly identical to installing a normal hardwired smoke alarm, for better or worse. Remove the existing alarm and its mounting plate, screw the new mounting plate into the work box, plug your Onelink into the existing connector, and attach the alarm to the mounting plate with a clockwise twist. The Onelink, when connected, will chirp every minute or so if mounted incorrectly, so make sure you’ve got a ladder and some free time. Thanks to either an overzealous tightening of the mounting plate or my frustrating attempts to install the alarm in a brutal heat wave, it took me over an hour to get it up and running. Since the Onelink is ceiling-mounted, it’s out of the way and easy to ignore. It uses that placement to its advantage, delivering a pretty impressive bass compared to desk-bound voice assistants or speakers. There’s nothing in the way to impede its audio quality either, making the Onelink reverberate from above like the voice of some synthetic deity. The Onelink doesn’t get as obnoxiously loud as my Google Home, nor is it comparable to the audio quality you’d get from something like a HomePod, but it doesn’t have to be as booming to effect the ambiance throughout my flat. “It feels like I’m in a nice airport,” said my partner after walking through the hallway while the Onelink played some funk music. That placement also makes it easier for it to listen for voice assistant commands. The Onelink is in a hallway bisecting myflat. Whether I was 30 feet away in the kitchen, as far as I can get from the Onelink, or in the bedroom (two feet from the Onelink) it was able to pick up my voice and respond to commands as quickly and seamlessly as an Amazon-made Echo device. Like an Echo device, the Onelink supports music streaming platforms Audible, Spotify, Pandora, and others, as well as Alexa skills you’ll probably never use. Alexa isn’t exactly the best at telling you whether or not your house is ablaze, even if you do enable the corresponding Onelink skill. When asked “Alexa, is my house on fire?” Alexa first attempted to play Rise Against’s “House on Fire,” then said it didn’t know what I was talking about when I repeated my question. To get actual answers, you’ll have to tell Alexa to ask Onelink about its status. Don’t worry about power cuts or lost internet connections affecting its primary function as a smoke alarm. The photoelectric smoke alarm and electrochemical carbon monoxide detector components work as intended, and the Onelink lets out a piercing alarm paired with a too-pleasant voice declaring the source of the fire, which is basically the user-defined location of the Onelink itself. You’ll also receive a notification on your smartphone letting you know your house is going up in flames. If your home is wired to support interconnected alarms, it will trigger them all, ensuring you get the hell out of bed and out the door. The usefulness of a voice assistant and speaker jammed into a smoke alarm relies on its location, which is one of the few negative points of the Onelink Safe and Sound. You can only put it where you smoke alarms are. Unlike an Amazon Echo, that can sit on any worktop, table, or ledge, the Onelink is a smoke alarm first, which means you’ll need to follow the instructions on smoke alarm placement and maintenance before you can enjoy its voice assistant features. Onelink’s mere existence makes me feel, in all honestly, like throwing out the other voice assistants in my house and installing a few more smoke alarms. Granted, the Onelink’s installation requirements are largely dependent on your home and its safety setup, and I’m not exactly gearing up to install extra hardwired smoke alarms in my rented flat, but I’d put one in each room if I could (or at least one in every room I can nap in). It’s out of the way, delivers clear and unobstructed audio, and adds a voice assistant to your home without it taking the form of a miniature obelisk. But £192 plus hefty international shipping fees is quite a lot of cash to drop on something like this, making one consider whether a £10 smoke detector and a £90 Amazon Echo are worth the savings compared to the convenience of the Onelink Safe and Sound. Great combination of functional smoke alarm and convenient Amazon Alexa voice assistant. HomeKit compatibility means one less smart device that doesn’t agree with your iPhone. Integrated speaker is cool, but won’t wow anyone. It’s expensive as hell, especially when you can get a voice assistant for under £100 and a smoke detector for £10.